A musical prodigy in war-torn Vienna, Joe Zawinul, born Josef Erich Zawinul, became one of the most influential jazz musicians of the past century. As a prominent jazz keyboardist and composer, he pioneered the use of electronic keyboards and was a leading force behind ‘jazz fusion,’ blending jazz with other forms of music. He is also credited with bringing African and Middle Eastern rhythms to mainstream jazz. Over decades, Zawinul received two Amadeus awards, several Grammys, the Miles Davis Award and the Preis der deutschen Schallplattenkritik. On the occasion of his death on September 11, 2007 at the age of 75, Austrian President Heinz Fischer referred to the loss of an “ambassador of music,” who was known and honored around the world. 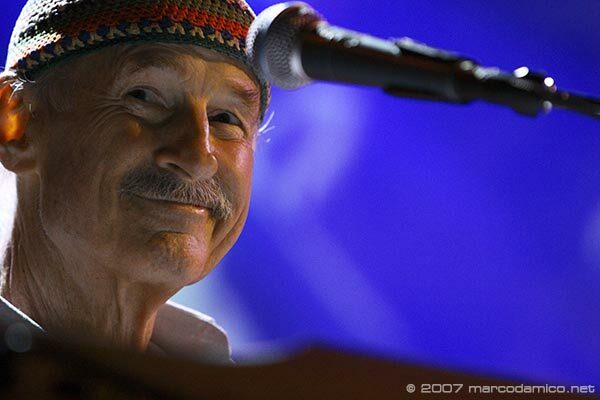 Joe Zawinul was born in 1932 into a working-class Viennese family in Vienna’s 3rd district. At an early age it became clear that he was a gifted musician. Like his mother, he had perfect pitch and played accordion on the street to make money. Because of his exceptional musical ability, he was offered at age seven a place at the Vienna Conservatory, where he studied clarinet and violin. Among the elite of the Conservatory students, he discovered jazz when he was twelve through the enthusiasm of a fellow student. During the postwar years he listened to American jazz records, such as “Birth of the Cool” from Miles Davis, working out the harmonies on his own. One of his best friends, also suffering from the bitter aftermath of the war, one day confided, “I want to make something out of my life - and you should too. Throw yourself into music, that’s something you’re good at!” This friend was Thomas Klestil, who as diplomat served as Austrian Ambassador to Washington, D.C. (1982 - 1987), and was elected Federal President of Austria in 1992. This proved to be a turning point for Zawinul. Having discovered the exoticism and freedom of jazz, he turned away from the career path envisioned for him - that of becoming a successful concert pianist like his older contemporary, the pianist and composer, Friedrich Gulda. Instead he rose during the 1950s through the hierarchy of Austria’s burgeoning jazz and commercial music scene, earning a growing reputation among his fellow musicians. Zawinul’s finest playing dates from the 1970s when he, together with the saxophonist, Wayne Shorter, founded Weather Report, a jazz-rock group which played together for fifteen years. In 1977, they celebrated their greatest hit, the Grammy award winning, “Birdland.” It is considered one of the most recognizable jazz pieces of the 1970s and was later performed by many prominent artists. In addition to his success in jazz he collaborated with his friend Friedrich Gulda during an open-air concert playing classical piano improvisation. He also composed a symphony which he called “Stories of the Danube,” commissioned by the Brucknerhaus for the opening of the 1993 Bruckner Festival in Linz. Zawinul was a prolific writer with a driving passion for musical discovery. In a eulogy published in Profil, Sven Gächter said: “His music carried the most precious element of all seals of approval: It was uniquely distinctive and it was unmistakably original.” Michael Haeupl, mayor of Vienna, announced that Joe Zawinul would be given an honorary grave in the Vienna’s main cemetery close to the presidential crypt.